As well as the big 3D printed locomotive shells and parts, I often get asked for small parts and this week I wanted to share with you my design for my smallest yet. I was asked by a fellow modeller if it would be possible to produce an N Scale Re-Railer to super detail his locomotives. Re-Railers or Rerail Frogs as they are sometimes called come in all shapes and sizes, typically they are metal castings which are designed to be easy manhandled. The type I will be looking at is a Y shape with a slot in middle which is designed to straddle the rail. 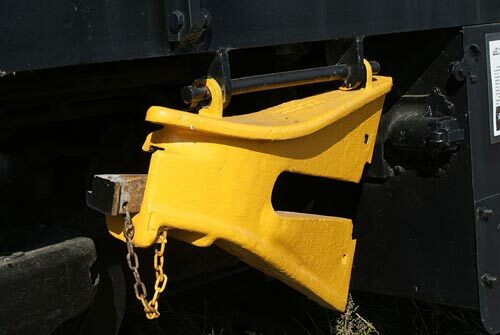 These are usually carried on locomotives, incase of rolling stock derailment, either on the side of the trucks or slung under the chassis. They work by straddling the rail next to the derailed train car wheel, then the locomotive either pushes or pulls the car so that the derailed wheel runs up the Re-Railer and back onto the track. Normally a pair of Re-Railers are used because when one wheel comes of so does the other, the Re-Railers are handed and are designed to work as a pair. A good photograph of the exact Re-Railer I am modeling can be found here on the translation directory. Modelling the Re-Railer was not the challenge with this project, that came with the actual size and making it printable at 1:160. A real Re-Railer is barely 1 Meter (39″) long which in N scale is only 6.25mm (0.24″). My first draft as shown below was an accurate model of the Re-Railer with some of the details over-sized such as the mounting lugs and flanges to make it printable. However even with the increased sizes the overall part was still unprintable. The problem lay with the hole in the mounting lug. In order to get enough material around the hole to make it printable the lugs became unrealistically large, and if the hole was made any smaller it would also not be printable. To resolve this I also included the mounting bar and corresponding lugs as shown in the images below; these are normally part of the locomotive. This solved two problems; firstly, by replacing the holes in the lugs with the bar the thickness of the lugs was no longer a problem, and secondly it would be easy to glue the part, once painted, directly to the underside of a locomotive chassis, as illustrated below on one of my DT6-6-2000 locomotives. However this design was also unprintable, but not by much. The black mounting bar shown in the images above is technically a wire by the 3D printers definition of parts. This means it has to be twice as thick in order to survive the post print process and to guarantee that it will arrive in one piece. Where the bar protrudes out of the mounting lugs is okay because this is classified as a detail and is supported by the thickness of the lug. I didn’t want to increase the size of the mounting bar as again it would become too unrealistic so as a compromise I filled in half of the area between the bar and the main body of the Re-Railer as shown below. Given the actual size of the part and that it hangs under the locomotive in shadow this will not be noticeable, especially if the raised part of the bar is painted a different color to the filled-in section. The test print for the Re-Railer has now been completed and is due for delivery later this week. In a later post I will share with you how it came out and what it looks like on real model.